2 blocks to 1 partner. It is a BOM quilt from 2011, by TK Harrison. Very cute and easy quilt! Great for beginners and advanced quilters alike! This original design for BOMquilts.com and AbbiMays.com! I chose it because it looks like it would be scrap friendly--in moderation! If you get your block and it meets requirements please rate a 5. Hearts, as always, are at your discretion. Please no quilt police - we all try to do our best and I really want these swaps to be inviting and not stressful. However, with that in mind I do understand that measurements are super important with quilting...so if it is way off please give the swapper the chance to re-do the square for the full 5. Scrappy materials, in 3 main colors. 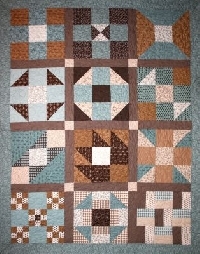 The Quilt pattern calls for Brown, Blue, and White. Since we are doing these scrappy, please feel free to change your "brown" to a "blue" or "purple" and use that criteria for the whole square... These should be prints, no solids - this is meant to be scrappy. Generally, smaller scale prints work best. that you mail SHOULD BE 18 1/2" X 18 1/2" each (which will finish in the final quilt at 18" x 18"). Let's have fun with this! Please ask any questions below and I will answer them as quick as possible. Private message me for faster responses. Rating of 4.98 or higher required. Any recent 1s or 3s please message me first. Newbies message me first (after you have filled out your profile). I will keep hosting these swaps every month until we have all 12 squares finished! PLEASE NOTE: This is my first time hosting. I want this to be a successful series, so if you see anything I did not mention, or need to change, please feel free to let me know. I'm not a fan of brown either. the blue and purple were examples of some other color to switch to... please choose a color scheme that you like. I think I may go with blues, purples, greens, etc. since I have the most of those. definitely not brown. Don't have any, don't care for it. I think this set may be purple and green. next swap may be green and blue. or even blue and purple. Those are my go-to colors. please do not feel restricted by the original colors of the quilt. choose your own. I have tried to turn this into a SCRAPPY quilt. I am not going out to buy new fabrics at all! I will be using my stash for this.